The Mod2 Center Channel is a small, high output solution for excellent dialogue. It can be used with much larger bookshelf or tower speakers. If you are sitting further than 14 feet consider the MOD4 center. ORB has an incredible reputation, but not just for sound. If you do your homework, and we hope you do - you will discover that the people at ORB really care. We want your room to sound amazing because every home is a showroom for us. When you buy speakers from ORB, you can expect the highest quality components and intelligent, American customer support. We are always happy to help you find the right system, get things set up, or tune things perfectly for your room ! This system includes our iconic Mod1 Speakers, the same ones we use in our MOST expensive systems. 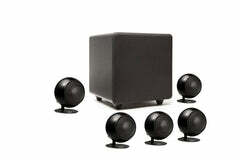 ORBs have some of the most precise imaging and soundstage at any price. You will notice details that have been in your favorite music for years, just hidden. The result is incredibly lifelike Sound effects that will make you jump or turn your head. Buying web direct means you get more for your money. Neodymium magnets, Aluminum drivers, long throw CCAD voice coils, Santoprene surrounds and Gold plated binding posts work brilliantly to yield very high output while maintaining crystal clear details. 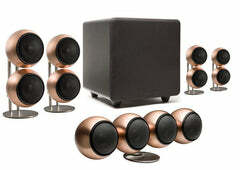 Steel, Copper and Bronze are polished and or antiqued by hand in an extremely labor intensive process that would be impossible if we were mass producing our speakers. Flexibility to customize is unique to ORB -- no speaker will ever become obsolete. If your needs change, add more ORBs!